Versatile 2-bay NAS engineered for total data protection. Network & Communication. 218 SAN/NAS Storage System. RAID Levels: 0, 1, Basic, Hybrid RAID, JBOD. Network (RJ-45): Yes. 1 x AC Power Cord. Limited Warranty: 1 Year. Solo ioSafe new with wire accessories, feel free to ask questions and send offers. Unit has been tested working onsite! Unit has wear from previous use including scuffs and scratches. Includes unit only. Photos of actual item for sale. No power cable included. Unit is on hand and ready to ship. Please feel free to message us any question you may have. Thank you for checking out our listing. .
Don't leave yourself vulnerable for weeks or months trying to backup your entire computer to the cloud when you can have the ioSafe Solo G3 protecting your entire digital life in minutes. The ioSafe Solo is the simplest and safest way to instantly protect your entire PC or laptop. NEW IN BOX ! Never used ! Open box only ! Please see photos as they are part of the description ! Please view my other listings for bundle discounts or combined shipping ! Enjoy! Liquidation forces sale! Protects DataFrom Flood: HydroSafeTM Technology. Trending at $111.00eBay determines this price through a machine learned model of the product's sale prices within the last 90 days. Manufacturer Part Number: SK2TB. Then to top it off, we wrapped it in a purely elegant design and backed it with an unparalleled Data Recovery Service.The result:A combination of technology, design and versatility that is truly in a league of its own. IOSAFE SK3TB SOLO G3 3TB External Hard Drive. P/N: SK3TB. Fireproof & Waterproof. 3TB External Hard Drive. Model: SOLO G3. Item Details Condition: New, Bulk - No Box. Mfr Part #: SM4TB5YR. We designed the SoloPRO to be the safest, fastest, and most versatile hard drive we've ever made. ioSafe SoloPRO External Hard Drive. ioSafe Solo PRO. Storage Capacity: 4 TB. eSATA/USB 2.0 or USB 3.0 Fireproof Waterproof External Hard Drive Data Recovery Service. Manufacturer Part Number: SK4TB. ioSafe Solo G3 4 TB 3.5" External Hard Drive - USB 3.0 - SATA - Desktop FIREPROOF AND WATERPROOF The Strong Silent Type. For users that demand that data storage be protected and not heard - the Solo G3 with the latest fanless FloSafe Vent Technology is strong and silent. Versatile 2-bay NAS engineered for total data protection. Network & Communication. 218 SAN/NAS Storage System. Network (RJ-45): Yes. 1 x AC Power Cord. Check-Out Now! Limited Warranty: 1 Year. 1 x Quick Installation Guide. 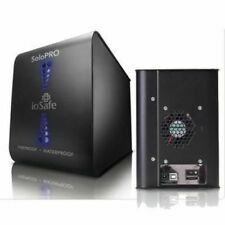 Solo ioSafe Fireproof and Waterproof 1.5TB External Hard Drive SL1500GBUSB20. Condition is Used. Shipped with USPS Priority Mail. Product Model #: SK6TB. Product Model # SK6TB. ioSafe SOLO G3. For users that demand that data storage be protected and not heard - the Solo G3 with the latest fanless FloSafe Vent Technology is strong and silent. 2TB capacity 1. Provides full support for Windows MAC and Linux. Includes usb 3.0 cable and power adapter. Data transfer up to 5 Gb/s. Protects data from loss up to 1550°F for up to 30 minutes per ASTM E119. 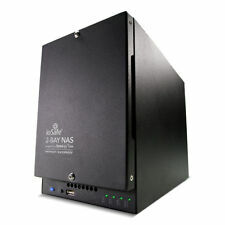 Compatibility: ioSafe NAS Platforms Device Supported: Network Storage System. Rack Mount. Front and Rear Cover. Mfr Part #: 5BAYNASRCKMNTKIT. IoSafe 1517 NAS. ioSafe 1517. Scale Up to 180TB with one or two ioSafe X517 Expansion Chassis®. Like an aircraft black box for data, there's not another product on the market which combines the security, protection and features of the 1517. Like an aircraft black box for your digital data, the ioSafe Solo is the world's first, high capacity, fireproof & waterproof external hard drive. Using a simple USB 2.0 interface, the ioSafe Solo works with your PC or Mac just like any other USB external hard drive. Manufacturer: ioSafe, Inc. The Solo G3 for Mac is a fireproof, waterproof external hard drive - like an aircraft black box for your most precious or critical data. Solo G3 for Mac. Product Series: G3. 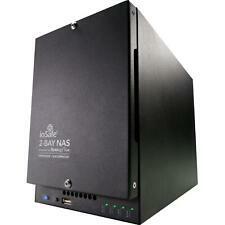 IoSafe 1515 5-Bay NAS External Storage by Synology DSM FireProof WaterProof w/ USB Ethernet eSATA 2 TB HDD. Product Line: IoSafe. Hard Drive: 2 Terabyte Hard Drive. Features: Waterproof, Fireproof. Type: ﻿Network Attached Storage (NAS). Manufacturer Part Number: SM2TB5YR. ioSafe SoloPRO 2 TB External Hard Drive - USB 3.0 ioSafe Solo PRO. Product Family: SoloPRO. ioSafe SoloPRO External Hard Drive. Product Line: SoloPRO. Manufacturer: ioSafe, Inc.
Fireproof - Protects data from loss up to 1550°F for 1/2 hour per ASTM E119. New, no box. Zero hours. DRS Expires 2019-9-06. Mfr Part #: SM4TB1YR. We designed the SoloPRO to be the safest, fastest, and most versatile hard drive we've ever made. ioSafe SoloPRO External Hard Drive. ioSafe Solo PRO. Storage Capacity: 4 TB. eSATA/USB 2.0 or USB 3.0 Fireproof Waterproof External Hard Drive Data Recovery Service. Mfr Part #: SK2TBMAC. The Solo G3 for Mac is a fireproof, waterproof external hard drive - like an aircraft black box for your most precious or critical data. Storage Capacity: 2 TB. Solo G3 for Mac. Mfr Part #: SK3TBMAC. The Solo G3 for Mac is a fireproof, waterproof external hard drive - like an aircraft black box for your most precious or critical data. Storage Capacity: 3 TB. Solo G3 for Mac. Mfr Part #: NCX0000. With its fire/water protection, superior performance, scalability, resilience, and comprehensive features, ioSafe® X513 Expansion Chassis is the ideal storage solution extending the capacity of your ioSafe NAS unit. 4TB Hard Drive in Good Condition. 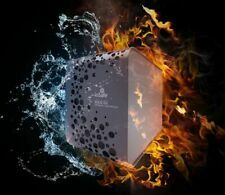 (IoSafe SoloG3 2TB USB 3.0 Fireproof and Waterproof Ext. HDD with 1 Year Data Recovery Service. Solo G3 USB 3.0 2TB 1YR. Guam, Puerto Rico, Virgin Islands, etc.). Check-Out Now! IoSafe 218 2TB[1TBX2], NAS HDD,1YR DRS (218-2tb1yr). Product Title ioSafe 218 2TB[1TBX2], NAS HDD,1YR DRS (2182TB1YR). Manufacturer ioSafe, Inc. Marketing Information Versatile 2-bay NAS engineered for total data protection.